Review the written installation instructions that came with your drain. There is more than one type of drain and yours may vary slightly from the photos shown here. Pop-up drains work by attaching the lift rod on your faucet to a mechanism below called the linkage. The linkage connects to a part called the ball lever or ball rod assembly that is attached to the drain. If the drain stopper is not moving or closing, check the adjustable link. Remove the clip that holds the link in place by squeezing the clip ends together. Move the linkage up or down to a different hole to adjust the stopper movement. Check stopper movement; readjust if necessary. The ball rod holds the stopper in the drain. To reach the stopper, the ball rod needs to be removed first. The ball rod is inserted into the side of the drain and attached with a nut. 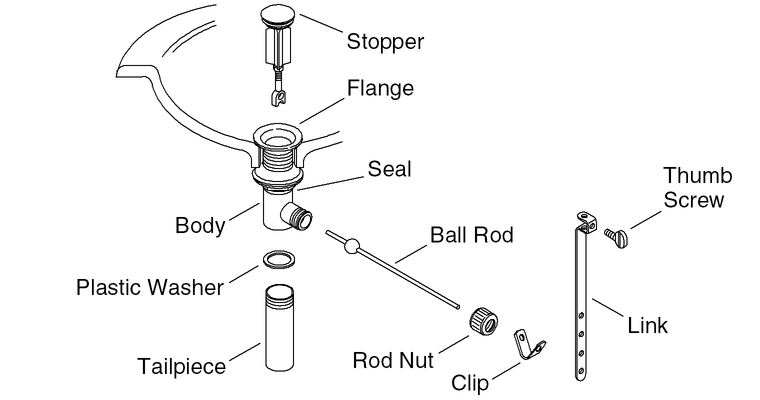 To remove, unthread the rod nut, pull the ball rod out, and remove the stopper from the drain.